In the spring of 2007 Tom and Ingrid Jones decided to visit a child they sponsored at a Christian school in Sosua, Dominican Republic(DR). 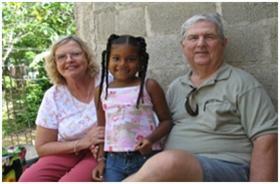 After traveling to the DR, Tom and Ingrid met with Luisa Colon and her family. While visiting in the family home, which was a ranshackled wooden hut, the Jones' felt a "nudge" from God that they should help reconstruct the house. They started sending money on a monthly basis to buy concrete blocks and construction material. Luisa's father, Luis, and his friends built the walls around the old shack so the family would not have to move during the reconstruction. When the walls were completed, Tom and Ingrid hired a licensed contractor to inspect the walls and build the roof. Once the roof was installed, the old wooden structure was removed from inside the new house and the doors, windows, and interior walls were built. In the meanwhile, Luis and his friends were installing a fresh water system that allowed the family, for the first time, to have an indoor toilet and shower. 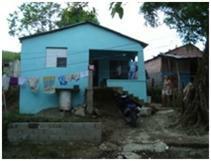 Luisa now has a sturdy, weather proof home with a living room, dining room, kitchen and bathroom with running water and two bedrooms. We praise God for leading us to do this! While this work was proceeding, The Jones’ felt another nudge from God that there were many more people needing the same kind of help. Thus Ingrid’s Villages, Inc (IVI) was born. The purpose of IVI is to build and finance interest free homes for families who have one or more children enrolled in a Christian school and are unable to qualify for a regular mortgage. Tom and Ingrid were able to raise $125,000 from themselves, donations from St. Paul United Methodist Church, friends and relatives. IVI then became an outreach ministry of St. Paul UMC, Largo, Florida. With the money raised, the Jones’ were able to satisfy all of the legal requirements to operate the mission in the state of Florida and the Dominican Republic as well as becoming an Advance Project of the United Methodist Church. A tract of land was purchased near several Christian schools upon which up to 27 new homes and a worship/community center can be built. IVI has reached a partnership agreement with the Dominican Evangelical Church (representing 90 churches primarily sponsored by the United Methodist Church) in order to raise $350,000 to accomplish our goals of providing 12 homes in a pilot project and bringing families to Jesus Christ.